﻿Spring has sprung, and soon farmers markets across the state will be buzzing with farmers selling their Virginia-grown products. 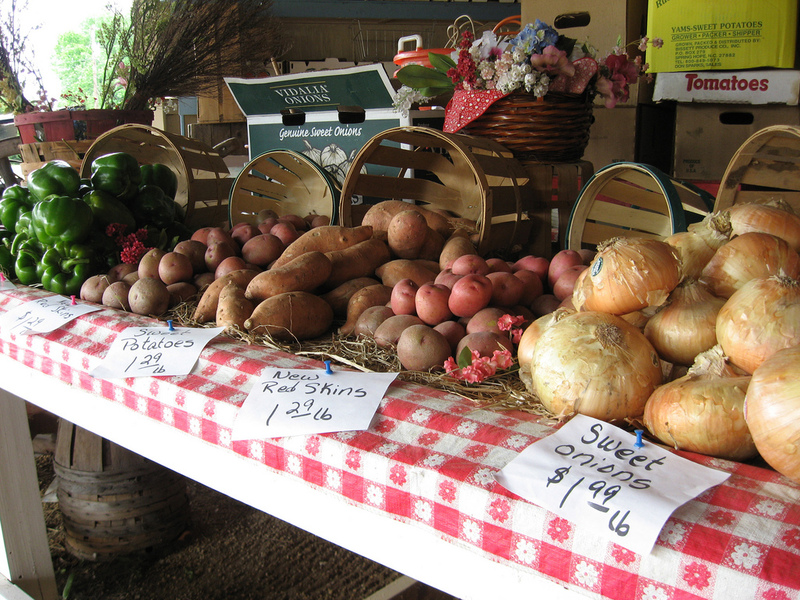 Virginia Cooperative Extension put out an excellent article in 2008 for farmers who direct market their products on collecting Virginia sales tax. We thought it would be helpful to post it here for those of you selling directly to consumers. We’d like to note one update that has occurred since the article was published. During the 2011 Virginia General Assembly, legislation passed that states individuals who raise and sell agricultural products at local farmers markets and roadside stands do not have to collect sales tax if their annual income from their sales does not exceed $1,000. The seller is also exempt from collecting the litter tax if his annual income from such sales does not exceed $1,000, and that any container he provides to hold purchased items has been previously used. Historically, farmers have not paid sales tax on many purchases used in agriculture production, nor have they been concerned with collecting sales tax because they have sold a commodity product to a wholesaler or middleman. Many Virginia farmers have entered into the realm of “Direct Marketing” by selling produce, meats, further processed foods, feed for pleasure animals, etc., directly to the consumer. When they sell retail or to the “end-user” they must collect sales tax on gross receipts from all retail sales. See Figure 1 for a flow-chart defining when sales tax must be collected. Farmers are obligated to collect and remit the sales tax on all retail sales to each customer. Retail sales can be thought of as the sale to the end user as opposed to a wholesaler. There are no exceptions or special circumstances allowed for farmers selling their own production. The tax must be separately stated and added to the sales price or charge. The Virginia Department of Taxation is the state agency responsible for insuring that this occurs. Individuals, partnerships, corporations, etc. must file for a Certificate of Registration if starting a business in Virginia or desiring to conduct business as a dealer by selling directly to the consumer. The farmer must register with the state by filing State Form R1, Combined Registration Application Form (http://www.tax.virginia.gov/taxforms/Business/Registration/R-1.pdf ), and must collect and pay the tax due on retail sales. Once registered, the farmer will be assigned a Virginia tax identification number that will be used when conducting business with the state. If your application indicates that you will be collecting sales tax, the department will send you a Virginia Certificate of Registration for sales tax. This certificate permits sales tax collection, and allows the farmer to issue and receive exemption certificates. The Virginia Certificate of Registration must be displayed at your place of business. The farmer should also apply for a Federal Tax Identification Number (FEIN) by going directly to the IRS (http://www.irs.gov/businesses/small/article/0,,id=98350,00.html). Sales tax rates fall into two basic categories that farmers selling retail need to be aware of. These are food and non-food categories. The basic sales tax for non-food items is 5% of gross sales and is comprised of 4% for the state and 1% for the locality. Food sales are taxed at a total rate of 2.5% of gross sales, which is comprised of 1.5% for the state and 1% for the locality. Department of Taxation Bulletin 5-78 discusses the sale of eligible food items subject to the reduced state tax rate of 1.5% as are deemed eligible under the federal food stamp definition. Many direct marketers also have the opportunity to sell to a wholesaler or further-processor in addition to their retail customers. The only way a farmer does not have to collect sale tax from someone purchasing product for resale is if that person provides the appropriate Certificate of Exemption. The sales tax applies to regular or recurring sales of farm products by farmers or peddlers at public markets, roadside stands, farms, etc. There is a provision for the occasional sale where you do not collect sales tax, but this is intended for the truly occasional sale, defined as three or fewer separate transactions within one calendar year, providing the activity does not require a Certificate of Registration. Because sales at fairs, flea markets, etc. generally involve multiple individual sales they are not considered occasional sales. The laws governing Sales and Use Tax are generally straightforward, i.e. 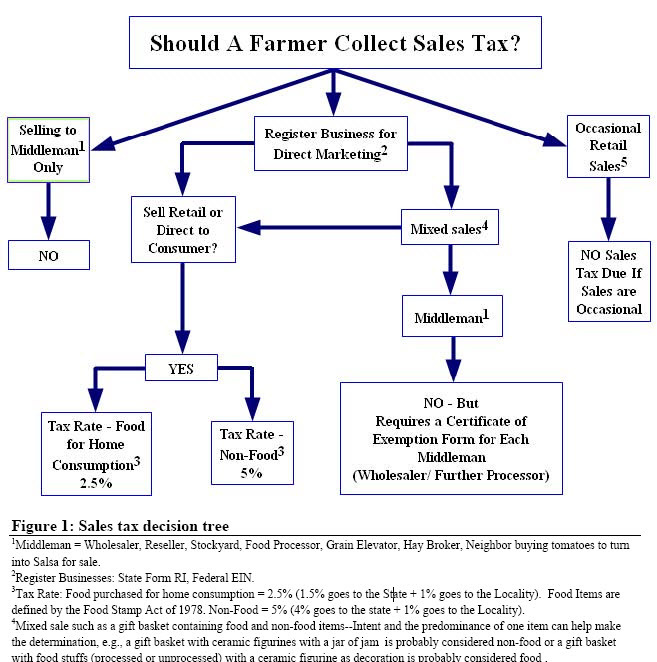 “If you are selling retail, then you must collect sales tax.” However, an individual farmer often has unique questions specific to his operation. To address specific questions, the Department of Taxation suggests that you write the Tax Commissioner for a ruling. Complete information on Virginia Sales and Use Tax can be obtained at the Virginia Department of Taxation website: http://www.tax.virginia.gov/ and use the Business Link to reach the Sales and Use Tax. ← AFBF President responds to Reps. Hurt and Altmire’s "Preserving Rural Resources Act"